It’s fall, the fashionistas have been watching, and all the reports agree: silver is definitely one of the must have metals to feature in your jewelry! The big, big, big trend toward charm jewelry, sparked by the Pandora phenomenon, continues to be strong. Part of the appeal of this trend is the ability of the wearer to personalize their own bracelet by selecting charms that they find personally meaningful. For the horse lover, that’s easy enough. 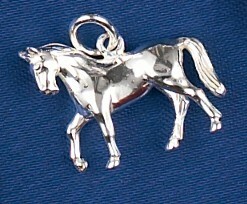 Simply check out this collection of horse charm jewelry. Talk about the ultimate in personalization: from breed symbols to boot jacks, there’s something there to relate to your relationship with horses and the memories you’ve made in the saddle. Don’t overlook the appeal of horse charm jewelry as a gift. For a relatively small price, you can buy a charm to add to a loved one’s bracelet. Remember a special ride, commemorate a great appearance in the show ring, or even indulge in some gentle teasing — the wheelbarrow charm is a great reminder piece for the teen who has to be prodded to go muck stalls! Another trend to watch for is the pairing of silver with natural materials, including wood and stone. Wood generally appears in bead form, especially if it’s marked with a strong grain pattern. Stone shows up as beads, dangles, accent pieces, or as the featured element in a ring, pendant, or bracelet. Bold, abstract design is making a comeback: great for those collectors who like to get a lot of show and sparkle from their collection. One trend that horse lovers may buck — oversized, ornate cocktail rings. While these elaborate pieces are popular for evenings out, they’re definitely not designed for life in the barn or around horses! Forget fashion here and opt for low or flat settings that are less likely to catch and be damaged.